Old Sweater | carpe diem! It’s one of those things you just don’t think about. It’s there when you need it, so you use it. It’s his, but I often wear it if I need something warm when working outside in the winter. Gran (his paternal grandmother) knitted it; I knew that much, and I’d guessed it was a gift when he was younger because it’s relatively small. It’s a sturdy, quite glossy wool (with my new-found knowledge I think it’s a longwool) in a peculiar shade of pale mint-green with flecks of pink. There are a few errors in the pattern stitch, and the seaming looks like my first efforts. There’s some staining where the collar rubs the wearer’s neck, a lot of pulled threads, the cuffs are fraying, and a felted scrap of red wool knotted into the fabric distinguishes the back from the front. When I came across it yesterday in my search for some other sweater I thought to ask how old it was. He paused and looked thoughtful. “Ohhh, probably about 1966”, he said. A Christmas present, probably, because no one in their right mind gifts woollens for birthdays in high summer. 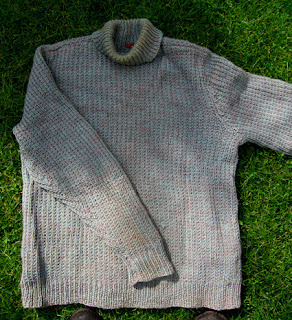 I commented on the rough seaming and asked whether Gran learned to knit late in life (I scarcely knew her, as she died in the early 1980s not long after we moved to the UK). He looked surprised. “She knitted all her life. Perhaps it was her arthritis? She’d needed two sticks to walk for as long as I can remember”. I thought about that. He was born in the early 1950s. Decades… DECADES of walking on sticks, living with pain. I thought of a picture I’d once seen of Gran as a Land Girl during the First World War, tall and slim in trousers(!! ), smoking a cigarette and laughing. I remember Gran sitting upright, poised and elegant in her hospital bed: she flatly refused to be seen by anyone until the nurse had applied her face and done her hair. I think of her working painfully, slowly, knitting sweaters to keep her grandchildren warm when they moved in 1961 to distant, cold Canada. The wear and stains show this one did sterling service over the years. I remember him wearing it under a down vest (we’ve still got that, too) standing over me and laughing when I fell over cross-country skiing, back when we were courting (a quaint phrase). That sweater is a memory palace in its own right, deserving to be packed away in lavender but… that’s not what it’s for. We wear it. Because it’s warm and it’s there when we need it. This will be the ‘Cherry Leaf Shoulder Shawl’ from Victorian Lace Today, a gift for someone who loves these colours. The yarn is Handmaiden Mini Maiden, a silk/wool blend, in ‘Periwinkle’. The yarn is lovely, soft with a silken sheen, just a trifle splitty – but perhaps that’s the pointy Addi lace needle. 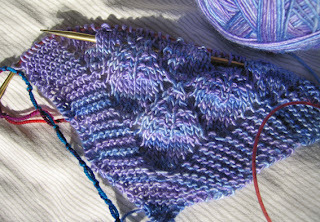 The pattern is an easy knit so far, although I’m a bit nervous about what will be my first knitted-on border. The Gairloch Socks are at the heels, where I’m discovering that 2-colour knitting *flat* is no fun. I think I need to learn to purl from the front. Alternatively I could abandon all this… my birthday present arrived early, yesterday. I have a copy of Cat Bordhi’s New Pathways for Sock Knitters AND several (I’m too embarrassed to count) skeins of STR. And then there’s work proper, trailing the field of desires… I must be strong. Perhaps one day this shawl will be a memory palace for someone. Incidentally the knotted bit of yarn on the left is a quick&dirty row marker. I slide the xth loop onto the needle when I start on the xth row of the pattern; finish the row, move to the x+1th loop. Exceedingly easy, more accurate than my old row counter, sadly not an original idea, I picked it up on Ravelry (sorry). This entry was posted in Uncategorized on September 11, 2007 by sarahw. You rarely get the same evocative memories with shop bought sweaters do you? They just don’t have the same pull on you. A memory of the person, time and place. I have a round yolk sweater in chunky yarn that I knitted for someone, Christmas 1991. They never wore it so I took it back and have been using it for exactly the same purpose as yours.The shawl is a great pattern and in such a pretty yarn. It’s going to make a great memory too. Cherry leaf is my favorite knit to date, despite the early struggles. I knitted it a little bigger (more rows) than the book suggests. I love the idea of knitted memories. I already think of some of my knits in association with the when and where they were knitted -my prarie shawl is really a ‘Tiree shawl’ & my ‘rugby world cup’ sweater is on the needles! The colours for your Cherry Tree are wonderful -is it another ‘purple thing’? I love the idea of a “memory palace” – such a wonderful keeper of a person, times and places. Another great post, Sarah. What a wonderful sweater story! I know my father had a favourite aunt who always knit for him in his early life. He is still the most wonderful person to knit for; he cherishes each and every sock, and is getting a particularly fantastic Aran from me for Christmas this year (though it’s still in the planning stages!). Beauty in form, function and memory; I can’t think of more perfect knitwear. What a wonderful post, and a treasure of a sweater. It reminded me of my grandfather’s sweaters. He had three exactly alike (store-bought) and my mom and I each took one. I have it in a travel bag he used for safe keeping, and it’s nice to see it when I miss him. Objects can be so powerful. 🙂In your last post you mentioned being a completist. I can really relate to that with knitting projects (even if I hate them, I can’t give up on them) and also with cycling (I do every last bit unless I’ll fall off or it’s too dark to see). There must be an antidote for this, right? and wouldn’t she be thrilled to think it’s still be worn and loved. Thanks for all the encouragement re spinning! I may say ‘yes’ to the books some day soon! I plan to start this weekend. School has been hectic this week so I have soothed my soul with the sweatshirt sweater!Some progress on the Peddler shawl though! Gran probably did ‘rough seaming’ because she didn’t know any better, despite being a long-term knitter. I was a rough seamer until a couple of years ago, because I didn’t know any better, despite having knitted for 40+ years. Hurrah for the interweb!I can only hope to be like Gran, being defiant in her hospital bed, insisting on her makeup. Good on her!